China’s meteorological authority said Monday that heavy fog will continue to cover the country’s northern and eastern regions during the morning, creating safety risks on roads and docks, as well as at airports. The National Meteorological Center (NMC) issued a blue alert early Monday morning, the lowest level in the country’s four-scale fog alert system. Fog and haze will decrease visibility to less than 1,000 meters in eastern parts of north China and most areas in the middle and lower reaches of the Yangtze River, including Beijing, Tianjin and the provinces of Hebei, Shandong, Anhui, Zhejiang, Jiangxi, Fujian and Hunan, the center said, urging people in these regions to drive slowly for safety reasons. 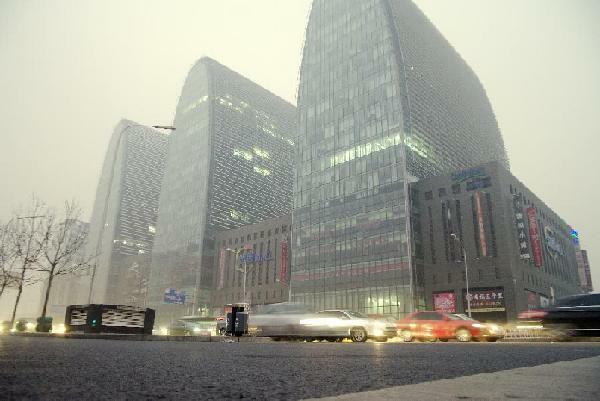 Thick fog disrupted more than 100 flights and closed expressways in Beijing on Sunday. A source with the Beijing Capital International Airport said the airport was forced to cancel 56 departing flights and delayed another 27 for at least one hour as of 9 a.m. Monday. Poor visibility also forced several expressways surrounding Beijing to temporarily close, and traffic authorities have warned of extended gridlock in the city. The NMC also forecast a strong cold front will travel across the central and eastern regions starting from Tuesday, bringing rain and snow as well as high winds to these regions over the next three days. Through Tuesday, rains are expected to cover central and eastern regions. Rainstorm is expected to hit parts of the southernmost Hainan Province. The cold front will also drop temperatures by more than 10 degrees Celsius in northern and northeastern China over the next three days, the NMC forecast.